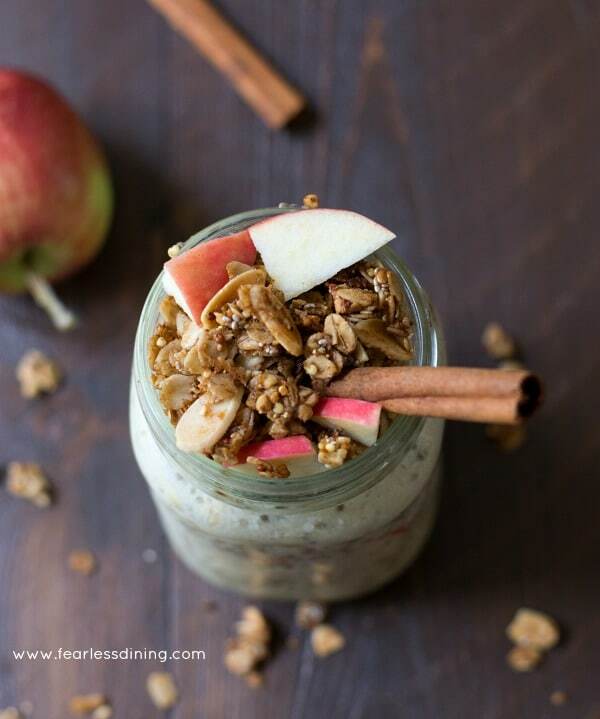 If your mornings are crazy busy, breakfast doesn’t get any easier than this easy apple crisp overnight oats recipe. Gluten free oatmeal is part of a nutritious breakfast. This recipe requires no cooking or waiting. Just toss the ingredients into a jar and put it in the refrigerator while you sleep! I hope this will be one of the best overnight oats recipes you try. Have you tried overnight oats for breakfast yet? My family will tell you it is the best overnight oats recipe we have made yet. Breakfast just doesn’t get any easier than this easy oatmeal recipe. 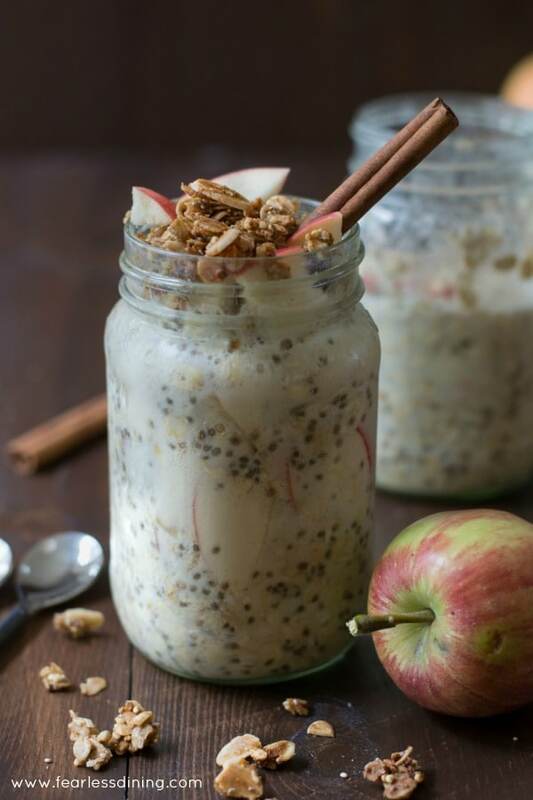 You dump gluten-free oats into a mason jar or other container, add any flavors, fruits, nuts, even chia seeds. Pick a dairy or non-dairy milk to pour in. Put it into the refrigerator overnight. Wake up to delicious oatmeal. Check out this easy Peach Cobbler Overnight Oats recipe. 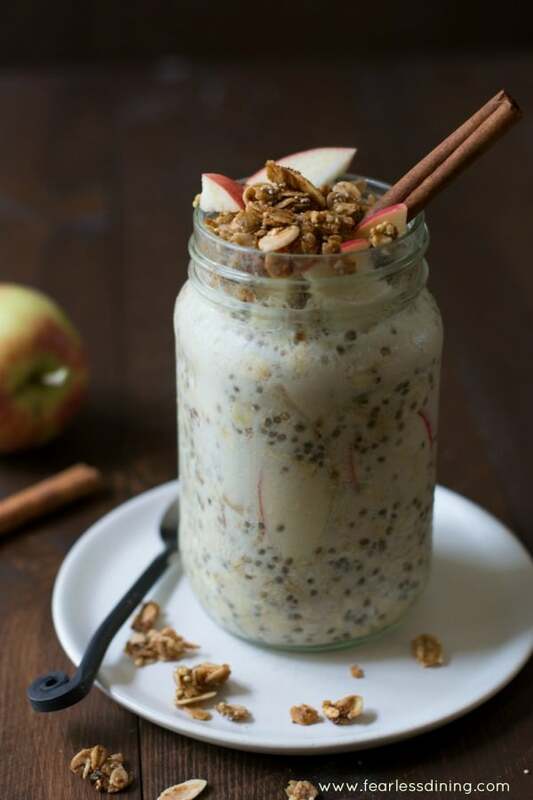 You can even use chia seeds to make an overnight Chia Pudding that is delicious for breakfast. This Matcha Green Tea Chia Pudding are both so easy to make! As a gluten free family, it is really important for us to eat certified gluten free oats. It isn’t that regular oats contain gluten, but most oats have gluten due to cross-contamination. If you are Celiac or gluten sensitive, look for Bob’s Red Mill Oats and look for their special gluten free label on the packages. 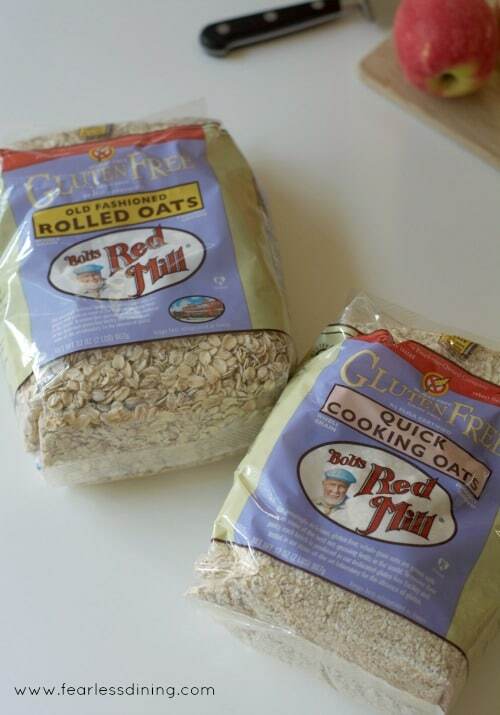 Bob’s Red Mill’s oats are certified gluten free so we can enjoy these safely. Bob’s Red Mill’s gluten free oats are packaged in a 100% gluten free facility and tested every step of the way to ensure their gluten-free status. They also make three varieties of gluten-free oats: Rolled Oats, Quick Oats, and Steel Cut Oats. I made my overnight oats with almond milk because it adds a protein punch while keeping this breakfast dairy-free. Oats are not only a versatile grain, but they are rich in daily fiber, which can help reduce cholesterol. I love that oats are not just for breakfast. 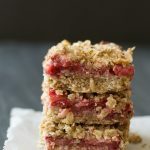 You can make both sweet and savory recipes like cookies, granola, and even meatloaf! **I used no refined sugars in this recipe to keep these overnight oats healthy. You can definitely use other sweeteners, but this works for my family. Homemade granola is so easy to make with whole oats. It adds a sweet crunch and gives this overnight oats recipe a fabulous texture! Here are two quick and easy homemade granola recipes for you to try! You can make a Cinnamon Granola, or try this Cardamom Vegan Granola recipe. Either easy homemade granola recipe would taste delicious with this easy oatmeal breakfast. If you prefer a paleo granola, you will love how easy grain free granola is to make. This easy overnight oatmeal recipe is so easy to make. 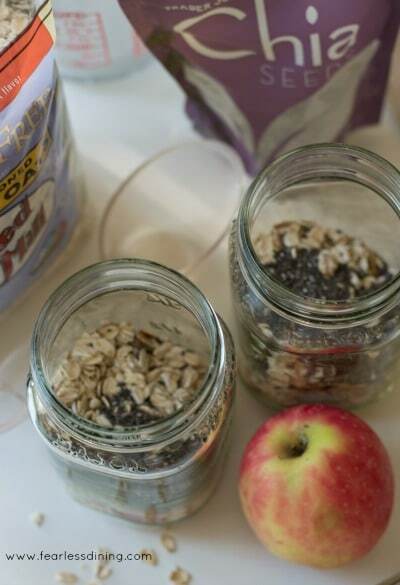 What container is best to make overnight oats? My favorite container to use is a mason jar. I like that you can screw the lid on, and it is easy to store in the refrigerator. You can also use glass tupperware containers. 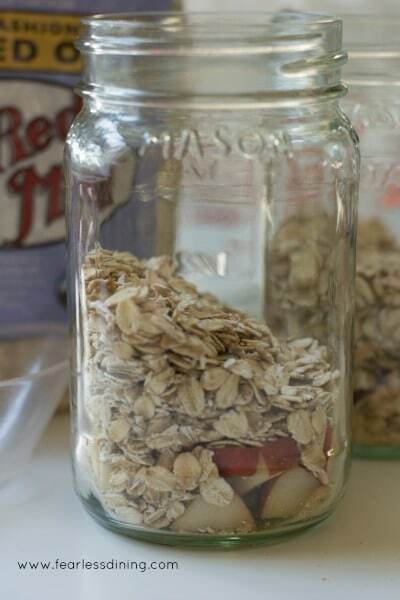 Take a mason jar, or other container and add chopped apples and Bob’s Red Mill Gluten Free Whole Oats. You don’t have to get fancy and make pretty layers since you will be shaking these up after you add the milk. Add some chia seeds, then the rest of the ingredients. Overnight oats are such a fun recipe to make with your kids! The next morning just open the jar and serve! Your kids are off to school, and they had a quick nutritious breakfast! You can also change things up in this recipe quite a bit! Feel free to try a different fruit. I have tried this recipe with fresh peaches, blueberries, and strawberries! If you don’t like maple syrup, feel free to substitute coconut sugar or honey. If you don’t like chia seeds, you can omit them from this recipe. Add 2 tablespoons additional oats. For a hint of spice, add a dash of nutmeg! Certified gluten free oats. Make sure your oats are certified gluten-free. Oats are very easily cross-contaminated with wheat so really make sure so you stay safe. Chia seeds. I add some in this recipe for some extra protein. Mason jars. These have so many fun uses. I am starting to store my leftovers in these because they are so easy to fill and close up. They stack in my refrigerator so nicely. Everything can go in the dishwasher. Easy overnight apple crisp oats recipe. Take a mason jar and pour in all of the dry ingredients. Add the apple and wet ingredients. Put the lid on and screw it tight. Shake the mason jar until all of the ingredients are blended. Put into the refrigerator and allow to sit overnight. The next morning, remove the lid, pour some granola on top and enjoy! 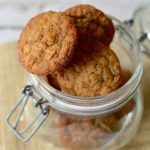 More Yummy Oat Recipes to Try!! That is so sweet of you to say Sibel. Thank you so much, you made my day!! I just love oatmeal, we eat it all the time. Your make-ahead version sounds even simpler and more delicious! AND with it being apple season these are perfect for the fall. Bob’s Red Mill is such a terrific product too! Can I make several of these for the week, what I mean is can I make it 4-5 days in advance? Thank you! I believe you can make it in advance, though I am not sure I would let it sit 4-5 days…it might get very mushy. You are so sweet Alisa. I am sure your version would also be incredible. 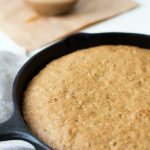 Love how easy this is and it look so delicious! Win! Win! 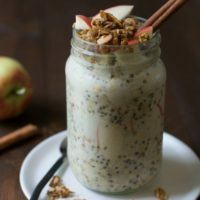 This looks like such a great easy and healthy breakfast! Perfect for back-to-school. Love that rustic wood background you use! And, this recipe sounds delish!! I’ve never tried overnight oats, I guess I’m going to have to! Very much liking this recipe. The easier breakfast is in the morning the better my day seems to go. I’ve never tried overnight oats, but this recipe sounds so good I just might have to. Thanks for sharing. I love soaked oats but this looks so amazing! This looks so good and easy, too! These looks so delicious! I am ready to eat it right now! I love overnight oats because there’s nothing better than having breakfast ready before I’m ready in the morning! It’s Apple everything season and I can’t wait to try this one! Thanks for sharing!! Nothing like a fantastic easy creamy breakfast like Overnight Oats!